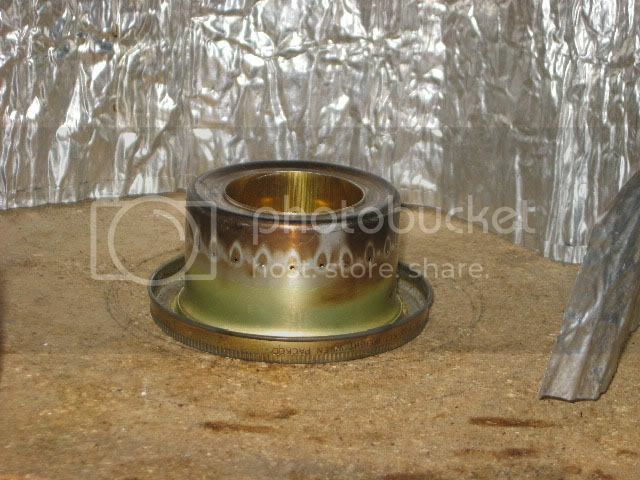 I have recently run a few tests comparing different pot sizes on a cat can side burner alcohol stove that I made from a design on the ZEN STOVES site. The test were done under the same conditions and with the same technique using my purpose built stove-testing facility that I have in my garage at home. Test conditions: 600m (2000ft) elevation, ambient around 20C. Fuel used was standard Australian Methylated Spirits (denatured alcohol) 95% ethanol content. 0.5 liters of tap water was heated from ambient (about 20C) to 95C then g/1 C/0.5l was calculated the result was then multiplied by 80 to get g/80C/0.5l, which was used in the final results. 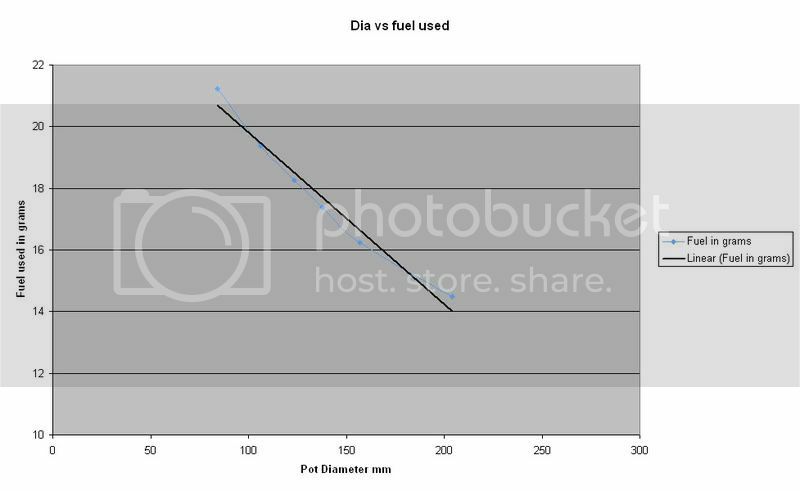 NOTE: I recorded up to a 5% difference in the amount of fuel used for some pot /stove combinations for these tests, this appears to be a normal amount of variation for stove tests. 6 pots where used in the tests, 84 mm (heiny), 106.3 mm, 123.5 mm, 137.5 mm, 157 mm, and 204 mm diameter. The stove diameter is 61 mm but being a side burner the flame projects out to have contact with the bottom of larger pots to about 75 mm to 110 mm in diameter which gives an approximate annulus area of 5000 mm^2, this flame contact area is different with smaller pots as the flame was shared by the bottom and the sides, pot/stove ratio is a difficult area to define and in the results I have used the stove diameter in the pot/stove ratio. NOTE: these results are for this particular cat can stove (pictured below) other stoves will give different results. 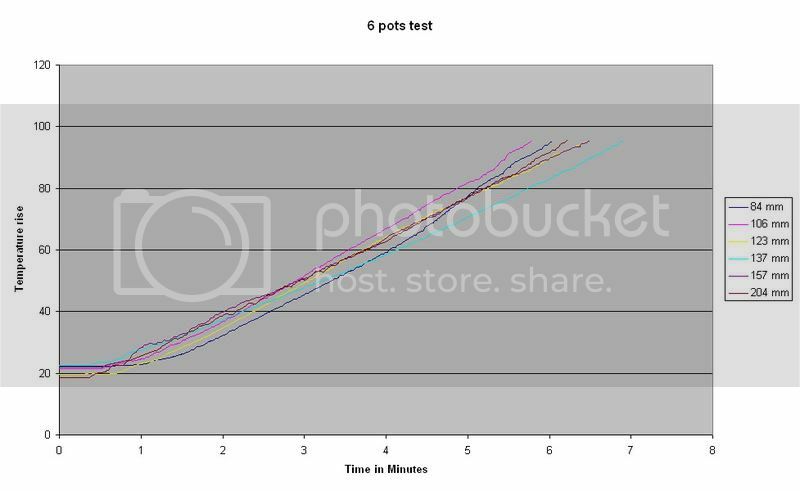 CONCLUSION: There is a clear relationship between pot sizes and flame sizes and efficiency, the higher the pot flame ratio the more efficient the stove pot system will be. Future work: I am hoping to do the same tests with a smaller side pressure stove to see if I can find a pot/stove ratio that matters and I will do some more tests with some top burner stoves. Last edited by Tony on Sat Jan 28, 2012 5:18 am, edited 1 time in total. Outstanding idea for a test! Thanks Tony for the data. Very informative. 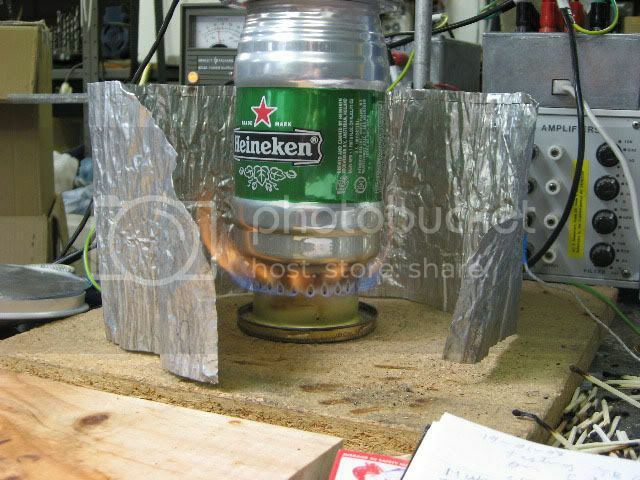 I was hoping to do an experiment like this for a formulation of a good portable stove. Any tips that you can give me? My hint:Buy heet by the gallon or case! It takes a lot of time testing and logging results,repetition of the same factors in the same identical conditions.I believe Tony has a lot of testing equipment as far as heat/btu levels,etc.. and is scientifically set up for what he's posted. 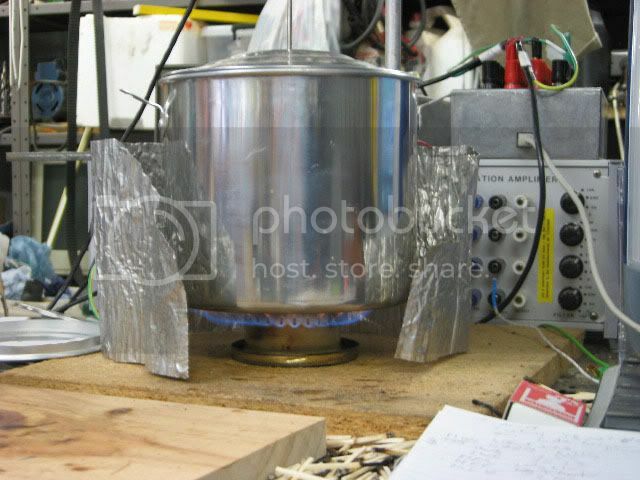 mhaxim wrote: I was hoping to do an experiment like this for a formulation of a good portable stove. Any tips that you can give me? I think a lot depends on what the stove is required to "do".Are you interested in something that will just boil water efficiently..or multitask like simmer,adjustable heat factors,etc..etc. ?There is lots of info here in other threads. It has been a while since I last posted, I am still playing with stoves but not as much as I used to, life has been very interesting and busy lately. As for pot size vs stove size I have done a lot of work trying to see if I can come up with a quantitive figure with alcohol stoves. As usual camping stoves are very hard to quantify, but I have come up with an approximate figure that seems to be consistent. If you want the most efficient stove pot ratio, put a large diameter pot on top of the lighted stove and take note of the diameter of the visible flame size (the outer edge of the blue flame) foot print under the pot, then add 10mm(0.393") to 20mm(0.787") per side or 20mm to 40mm to the diameter of the flame and that is around the ideal pot size, this appears to be true for side flame pots and center flame pots. Example, my White Box stove, is 59mm(2.322") diameter and it throws a visible blue flame of 160 mm(6.299") diameter, so the ideal pot size for a White Box stove is around 180mm( 7.086") to 200 mm( 7.87") diameter, any smaller and efficiency is lost and any bigger there are very little or no efficiency gains. EDIT, I have changed the title of this thread from "Pot Size does not matter" back to the original title "Does pot size matter"
Hi Tony!!! Good to see you By now you have a nice tan and 500 trail miles to your good. Your efforts have paid off. You make it nice and easy to calculate pot size. I put your MM dimensions into inches to make it easy for us blokes here in the frigid North. I think I'll do the pot size recomendations for all the stoves I have for sale. I have a nice large aluminum pot to use as my idicator pot. Glad you stopped by to let us in on your test conclusions. Thank you!!! We are having a mild summer this year, it has been very nice, I no longer chase a good suntan as I did when I was younger, skin cancer is a major problem here in Australia, and I am not immune from this, unfortunately these days I regularly get dangerous spots burnt off or cut out, when I go bushwalking I cover up and plaster sun block over my exposed skin. I got some great trips in last year, including a fabulous tramping trip in the Mountains in South Island New Zealand (Rees-Dart Track), I did the highest ten peaks in Australia, twice, once in summer and then again on snowshoes in winter, I managed two trips to one of my favourite bushwalking areas, the Monolith Valley in the Budawangs, I also got some great fishing trips in. This summer has been a bit quieter and I have only managed one fishing trip but it was a very good one, I landed around 80 trout in a weekend. I think I'll do the pot size recommendations for all the stoves I have for sale. I have a nice large aluminum pot to use as my idicator pot. It would be good to be able to give a pot size recommendation, I will be interested what sizes you measure the outer flame edges on your stoves. I cannot understand why the US has not caught up with the rest of the world and changed to metric, the metric system is so much easier to understand and use. We are slow to learn I use ml of alcohol when testing stoves and have to remind my self to convert to ounces when I go to post results.